WKM Properties is a small, family owned and operated commercial real estate business that provides space for businesses of all types in our Professional Building complex off 2nd St. in downtown Winona. We strive to provide our tenants with excellent customer service and we enjoy working with prospective tenants to create spaces that entirely fit their needs. 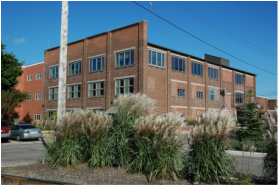 The building that WKM Properties now occupies was purchased in 1943 by Walker Woodworth and Harry Stone and became the [Winona] Knitting Mills. They chose Winona because of their dealings with Jack Temple and the Winona Textile Mill located on Second and Walnut streets. The Woodworths were attracted to Winona because of the community’s beautiful river valley setting, small town values, and a skilled and hard working labor force. When Walker Woodworth took over the 25,000 SF building in 1943 it had stood partially empty for a number of years. The roof leaked, the toilet and heating systems were gone, the elevator was shot and, overall, it was a dirty mess. The building was cleaned up, painted; and new boilers and a complete heating plant were installed. The Winona Knitting Mills opened its doors and knitted its first garment in August of 1943. In the coming years the building was expanded 17 times to reach its current size of 100,000 SF. During its lifetime, the WKM reached a number of significant milestones. WKM produced the famous sweater worn by Jeff Bridges in The Big Lebowski, and also, a number of Mr. Rogers' famous sweaters. In 2000, after 57 years as a sweater manufacturer, The Winona Knitting Mills, Inc. closed its doors. Pete Woodworth, Walker Woodworth's grandson and current chairman of WKM Properties, purchased all the manufacturing properties from the remaining Woodworth owners with a dream of converting it into a professional building complex for offices, warehousing and manufacturing. The property now includes almost 8 contiguous acres of land containing roughly 700 feet of Mississippi riverfront, numerous parking lots, truck and employee access areas, and 6 industrial buildings totaling roughly 225,000 square feet.